iPhone 6s Plus liquid damage repair service. Have you split a drink over your iPhone, or dropped your iPhone 6s Plus in the toilet? We will dismantle and clean your iPhone 6s Plus and attempt to restore the unit back to full working order. Our iPhone 6s Plus liquid damage recovery repair service, includes an ultrasonic cleaning bath for the logic board, this allows us to clean the liquid damaged iPhone 6s Plus if suffering from board level oxidisation, corrosion or maybe even a sticky liquid having dried or evaporated leaving a conductive residue.We do have a very high success rate with iPhone 6s Plus liquid damage repairs. The fee covers the thorough cleaning and testing of your device to determine whether it is repairable or not. Any repairs will be additionally charged however if we can repair your liquid damaged iPhone 6s Plus without replacing the complete logic board or screen this is all you will pay to restore your liquid damaged iPhone back to working order. Once cleaning and diagnostics are completed you will be contacted with a repair schedule if replacement components are required, however you do not have to proceed with the recommended repairs, we can if you choose send the iPhone 6s Plus back after cleaning and diagnostic stage. 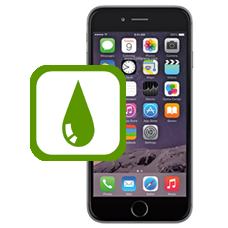 Please note liquid damage can have a lasting affect which may cause problems to your iPhone 6s Plus in the future. * Our normal repair turnaround times are 3-5 working days. We always aim to complete repairs as fast as possible. This is an in-house Apple iPhone 6s Plus liquid damage repair service, when ordering this service you are required to ship your iPhone into our repair centre for works to be undertaken. You will be sent shipping details once your order has been processed.